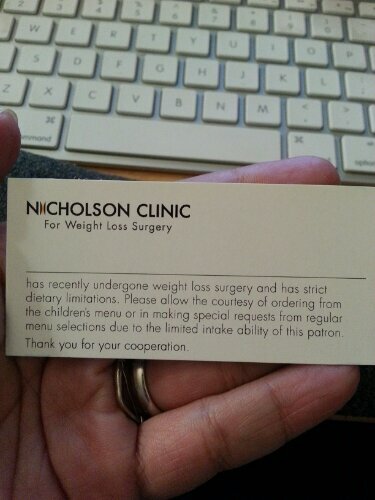 Some surgeons provide this card for their patients, some don’t. Mine did. I have elected not to use it. Here’s why. First of all, kids’ menus most places are full of crap, so they aren’t the best choices anyway. I mean, whoever thought that fried chicken fingers, grilled cheese sandwiches, french fries and the like were healthy choices for kids? Oh wait…kids’ menus aren’t designed to be healthy! So why would this even really be a choice presented to a WLS patient in the first place? I chose to have weight loss surgery in order to improve my health. In choosing to do so, I have also chosen to alter my behaviors in such a way that they force me to adapt to the rest of the world. I do not expect or demand that the world accommodate me and my altered anatomy just so that I can eat a meal. Not every establishment is going to honor the request on the card, nor should they be obligated to. Moreover, the world is not always going to have small plates, tiny portions, or protein-rich foods available. Splitting plates, especially if I am out to eat with my husband. Ordering a protein-forward appetizer, such as boiled shrimp, chicken skewers, or shrimp enbrochette. Asking for the plate to be split and boxed up so that I end up taking home leftovers. Leaving food behind. Sometimes this happens–there are not kids in China who would be grateful for that food, despite what your childhood lessons taught you about that. It is okay to leave food behind. If you feel particularly guilty about it, donate to your local food bank. Asking if a dish can be prepared a certain way. Can something be grilled or broiled? Can the extra pat of butter be left off of that steak? Asking for substitutes. Can I swap broccoli for rice or that potato? If chips/salsa or a breadbasket are de rigueur at the establishment we are dining at, my husband and I will ask the waiter not to bring them. If I am out with others and this is the case, I keep my hands off the table as much as possible because I know that these two foods are my Kryptonite and that I will Eat. All. The. Things. if they are within my reach. I will not deny others the opportunity to eat what they like because it happens to be something I have a tough time eating. I also sip on my drink to keep my mouth occupied. And hey, I get super hydrated too! Double win! Changing my eating out behaviors also means that there are simply some particular establishments we do not dine in at all. There are some restaurants that hubby and I would eat at quite often pre-op that now we do not set foot in because we know that there are no good choices for us on the menu. While this would make some folks upset, what it has done for us is force us to find new places that have menu items we can enjoy and that are good choices for us. This has been a great adventure for the both of us, as we enjoy dining out often. Another strategy we employ is a simple one: checking the menu of the place we’re considering online before going. So easy to do, but something that most people really don’t give much thought to. If we see that there aren’t many good protein choices available, then we don’t go. We make other choices that we know will be better for us. I do the same thing when I happen to be dining solo, which isn’t often. It’s all about changing your behavior, folks. Start with changing your behaviors, and the weight will find its way off your body. Changing what you eat is not enough. Changing how you approach food-related behaviors will make the change in your eating that much more powerfully effective. You do not need a card to tell the world that you have had WLS. Especially if you don’t want the rest of the world to know. This card is one surefire way to make sure that others know. You do not need a card to tell the world that you and your new GI tract are to be treated with kid gloves when you go out to eat. Because you don’t. Empower yourself by changing your behaviors. Empower yourself by taking control of your eating habits, changing them, and asking for the things you need. It is actually quite freeing to have that measure of control over your dining environment! Side note: So far this week has gone well. I’ve been under 900 calories all week so far, which is a win for me. My fat grams are down significantly over the last week so I’m hopeful that things will go well on Sunday. We’ll see. And if they don’t, well, then I’ll just plod on. The weight has to come off, it just DOES. I’m learning to be more patient with myself. It’s a hard lesson to learn, but I’m slowly learning. Today was a good day: 95 grams protein, 45 grams carbs, 32 grams fat, 877 calories, 120 oz water. 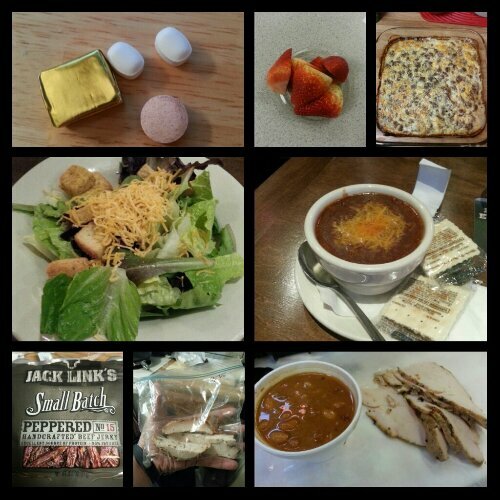 Today’s food choices, from upper right: egg white and turkey sausage casserole; cup of chili with saltine crackers snd cheese; Rudy’s smoked turkey and pinto beans; roasted turkey breast slices; Jack Link’s beef jerky; mixed green salad with cheese and croutons; multivitamin and calcium supplements x2, iron supplement; strawberries. This entry was posted in challenges, choices, daily bites, eating, habits, la guerra, little things, NSV's, oh behave!, planning, post-op, success, the little things, the sleeve, vsg, weight loss surgery and tagged being real, challenges, choices, daily bites, dining out, eating, empowerment, la guerra, little celebrations, NSVs, oh behave!, planning for success, post-op eating, post-op life, she's got skillz, sleeve gastrectomy, the sleeve, VSG, vsg realness, WLS, WLS card. Bookmark the permalink. I got a card and I have never used it. Most places don’t care if you want to order off the kids menu or senior menu anyway! I usually order and appetizer or split a plate with my fiancé though. There have been times where I have ordered my own plate for whatever reasons and every.single.time. the waitress will ask me if everything was ok with my meal. I always said yeah, it was good. And they asked me “are you sure? I can take it back for you if you didn’t like it” or something along those lines! I always thought it was kinda funny. And now I just say “Yeah, Im just really full” or “I can’t eat very much in one sitting” and always get boxes to eat it later. Even though its usually my fiancé who ends up finishing it off. Lol! I agree that I wouldn’t use one of these cards in a restaurant. Chances are, most restaurants will at least have a grilled chicken dish or a soup or something that is WLS-friendly. The patient advocate at my surgeon’s office did give me a letter to use when I travel so I would be able to bring protein shakes on the plane. I have a trip to San Diego coming up, and it would be nice to be able to bring a ready-made shake through TSA so I have something to eat on the 5-hour flight when my options are much more limited. Getting a letter to bring pre-packaged shakes on a plane (ha, see what I did there?) I can understand, especially given the rules regarding carrying fluids on a flight. And since your flight is a 5-hour trip with limited food options, you definitely have to be prepared!